So you can leave your subtlety by the back door today. What is this cybersecurity pioneer? Let’s sift through the ad, which is from editor Christian Olsen, and see what we can find. So what’s this flaw? Olsen doesn’t pinpoint one particular thing, but essentially it’s just that the internet has quickly become far more complicated and far more embedded in our daily lives, while security has so far failed to keep up. Which is sort of true, but not really at all about cybersecurity — that quote first aired in 2015, about a year before the election, and it was in response to terrorists using the internet for communication and recruitment. He later said similar things in 2017, following a London bombing, but again it was about cutting off the ability of terrorists to use the internet for recruitment. Which I’m sure is still an issue, but not at all the same thing as countering hackers and cyberattacks. “How high could cyber-security stocks go? “Years ago, our battles were mainly fought with ships, planes, and missiles. “And most people don’t know this, but the companies that did all the work to prepare for these old wars have been one of the most reliable… most profitable investments in the world over the past few decades. “The Dow Jones Index is up around 2,465% since 1980. “In fact, if you are worried about the stock market right now… and you want to put some money in a safe, very lucrative investment that could double, triple, or even quadruple in the years to come… there may be no better place…. “Between 2004 and 2017, global cyber-security spending grew from $3.5 billion to an estimated $120 billion…. He also cites Bank of America and J.P. Morgan as two companies spending wildly on cybsersecurity, and specifically includes a BAC job listing that he says “tipped them off” about the technology they were using. Which isn’t necessarily true, that ad really just asks applicants to be familiar with a dozen or so technologies from a bunch of different companies (Fortinet, Symantec, Checkpoint Systems, Juniper, F5, Cisco, FireEye, Radware, Zscaler, etc. — which is essentially the same as saying “almost every publicly traded cybersecurity company”). And that’s certainly not all of them — that’s not even half of the top ten holdings in the HACK ETF, some of which have not been around for long. 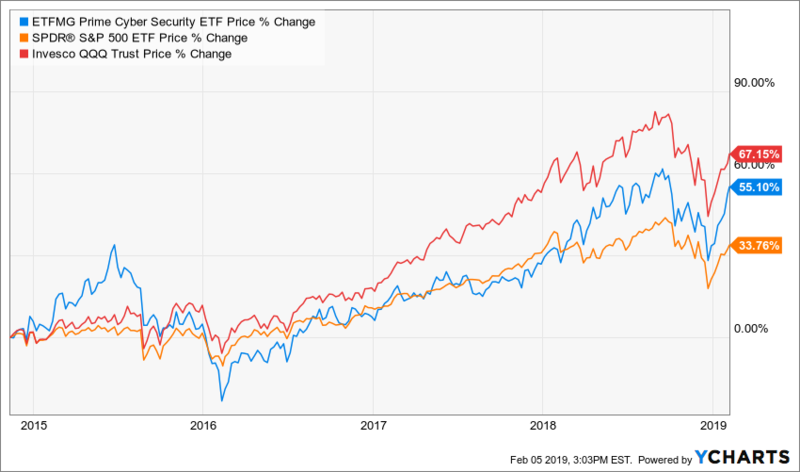 “If you’re looking to invest in this trend, you could go out and buy a sector-focused Exchange Traded Fund and potentially do well. One of the most popular funds is the Prime Cyber Security ETF (ticker: HACK). “It’s partnered with some of the biggest Internet technology firms in the world: Microsoft, Google, and Amazon. “And it’s quietly inked deals with some of the world’s top financial institutions like Edward Jones, the NASDAQ Stock Exchange, and some of the top banks in China, Korea, and Croatia. “It has more patents than any of its competitors — over 500 at last count with another 240+ pending. And that’s about all we get by way of clues… so what’s the stock? Which is, sadly, not the same as Fortnite, the video game your children and grandchildren are probably obsessed with (though that global video game craze is subject to cybersecurity fears, too, as Check Point (CHKP) recently reported… Fortnite is part-owned by Chinese giant Tencent, in case you’re curious). 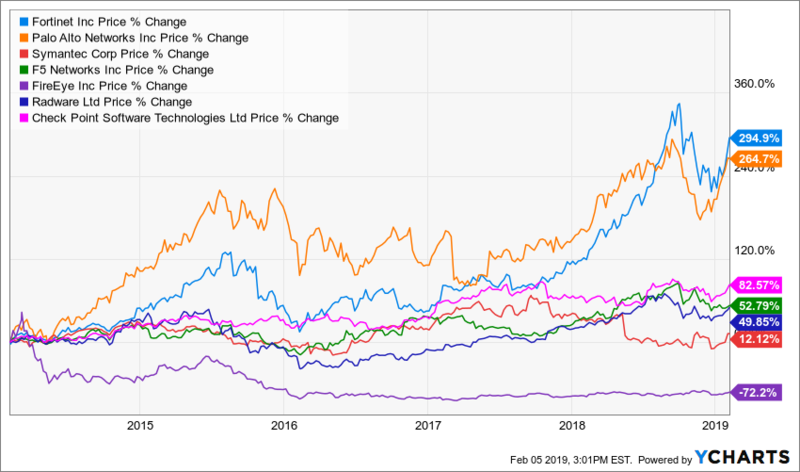 Fortinet is growing quite nicely, and has been among the stronger cybersecurity stocks in recent years thanks to a long series of “beat and raise” quarters and very strong revenue growth. What it isn’t is “cheap,” which you would probably guess given the “hot” sector — FTNT is trading at a forward PE of about 40 (on 2019 estimates) and will be reporting after the market close tomorrow, so it’s likely to be a very volatile stock over the next 48 hours (as it has been for much of the past year, recently surging to a new high on Oct 1 and then collapsing with the market through the end of December). Fortinet is a small company in the context of Cisco (CSCO) and Amazon (AMZN) and Microsoft (MSFT), I suppose, but it’s certainly not tiny — the market cap is about $14 billion, and it has $1.7 billion in sales over the past year… so it does take some hefty investments by their customers to move the needle in a big way, though it sounds like those investments are being made. The operating results indicate that they’ve been improving over the past couple years, too — profit margins have gotten up to almost 13% recently, after dropping to just about zero three or four years ago… so perhaps the competitive pricing pressure is not so intense, or they’ve managed to scale the business better in some way. This is a pretty appealing company in the abstract, they have some longer-term contracts (deferred revenue is over $1.5 billion) and plenty of cash ($1.7 billion, with no debt), so there’s some steadiness there — and it looks like the business has not been seasonal but has pretty much improved every quarter over the past couple years (just going by the basic numbers in their last quarterly earnings presentation). The only real challenge is valuation, it’s hard to justify paying 40X forward earnings for a company that is forecast to grow those earnings at only about a 15% average annual clip over the next couple years. It could be that they’ll grow faster, of course, or that Fortinet has a strong enough product offering to be worthy of such a premium, but it does make a purchase more challenging — particularly as I think about it using stale numbers, just a day before they’ll update us on 2018 and presumably offer some guidance for 2019. The major competitors for Fortinet in enterprise firewall technology, as I understand it, are Cisco (CSCO), Palo Alto Networks (PANW) and Check Point Software (CHKP)… Cisco doesn’t really count, since so much of their revenue comes from other products, but of that bunch of big players Palo Alto trades at a similar valuation (just over 40X forward earnings, though estimates are for better than 20% annual earnings growth) and Check Point is the more conservative choice (forward PE of 19, expected earnings growth of about 10%). I don’t know enough about the products or the different services provided to judge the quality of these businesses, but based on the numbers and Palo Alto’s slightly better revenue growth in recent years, I’d give PANW a slight edge based on my quick skim of the numbers. If you do like FTNT and decide you want to start nibbling here, the cautious route would be to start small and buy both before and after earnings — the company has beaten estimates handily for several quarters in a row, but just beating estimates isn’t enough at 40X earnings… for that kind of valuation, you have to either really blow out the estimates, or provide some future optimism if you want to please investors (or, preferably, both). On November 1 FTNT beat estimates handily and also caused analysts to increase their estimates for the full year, and the stock still fell by 13% on the day because they didn’t increase their guidance for the full year (it has since recovered that loss, the price is now, coincidentally enough, almost exactly the same as it was the day before they released earnings last quarter). So that’s my take on Fortinet after a few moments of research — clearly cybersecurity is a growing area of interest for investors, so if you like or dislike Fortinet or have other companies to call to our attention that are doing something special, please share your wisdom with a note in the friendly little comment box below… thanks for reading! Disclosure: I own shares of Amazon, Facebook and Google parent Alphabet among the stocks mentioned above. I am not directly invested in any cybersecurity stocks other than Okta, and will not trade in any stock covered for at least three days, per Stock Gumshoe’s rules. 11 Comments on "Stansberry’s Teased Pick for “New Arms Race” to “Save the Internet”"
Now I know why there a no storytellers like the brothers Grimm or HC Andersen today. They are all employed by the Stansberry folks. Current Melt UP Portfolio of 9 stocks doing fine. All in green with an average gain of 17% so far…. If you’re convinced that IBM will triple in a few years, that would be a far safer bet than the many blockchain startups that will never generate any real revenue. Don’t get hung up on the share price, just buy 2 shares of IBM instead of 100 shares of a penny stock. Not that I’m suggesting you buy IBM particularly, but investors tend to get hung up on share price for no reason — think market capitalization (size) and valuation and future prospects, not “price per share,” which is essentially arbitrary and dependent mostly on how many shares are outstanding. I like that advice. I recently ran across a stock (MKL) selling for over $1K – a bit pricey for me and never could buy 1000 shares. However, I like the stock so I bought 2 shares and am content to sit on them for a few years. OKTA should be making a profit with a gross of 70%, but they waste it all on selling and research. Investors are buying growth in Okta, not the current financial performance — without R&D, the product would gradually become worthless… and without selling costs they wouldn’t have growth. With a company like this, R&D is really part of the cost of the product and should probably be included in that gross margin. Maybe it will turn out that much of the spending is wasted, I don’t know, but like many “cloud” companies they are spending freely to try to build a huge future business. They’re all very richly valued, and all risky. Anyone else bullish on Okta? Identity management… Consistent growth and room to grow more. New (2018) entry level newsletter from Stansberry, features several special reports on big technology themes. What's being pitched by "The Firm that Recommended Amazon in 1999... Apple at $4... and Google before anyone else?"